The Kashmir uprising triggered by the killing of Hizbul Mujahideen Divisional Commander Burhan Wani on July 8 entered day 101 on Monday with entire Valley observing shutdown. During the shutdown, two sumo vehicles were set ablaze by unidentified person near Parimpora here for defying strike.According to GNS, hundreds of forces men were deployed in five police station areas of Srinagar’s Old City – MR Gunj, Nowhatta, Safa Kada, Rainwari and Khanyar – since early morning. There was however civilian movement without any disruption in all these areas. 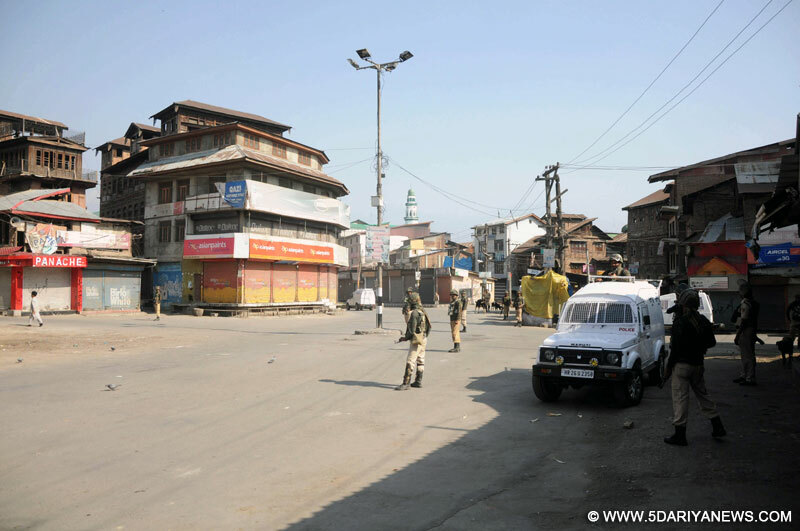 The areas like Habba Kadal and Maisuma were also under thick security blankt In Civil Lines and uptown area of the Srinagar, extra-ordinary movement of private transport and pedestrians was seen since early morning but all the shops, commercial establishments and educational institutes were closed. Besides, the vendors had set up their stalls at Batamaloo, Lal Chowk, Dalgate, Sonwar, Jehangir Chowk, Exhibition crossing and Jawahar Nagar. The forces were deployed at sensitive areas in strength.At Barthana near Parimpora, two Sumo vehciles bearing registration number numbers JK05B- 5863 and JK09-9209 were set ablaze by masked youth for defying shutdown early in the morning. The vehicles were completely gutted even as firefighters arrived at spot. The police also rushed to the spot and started manhunt.These two vehicles were coming from Kupwara and as per sources they belong to Jehangir Ahmad Dar of Cherkote Lolab and Muhammad Yusuf Khataba of Kalaroos. Reports said that later police launched a crackdown in Parimpora and Qamarwari areas to nab the accused and curfew-like restrictions were also imposed to prevent violence. The area was tense throughout the day.In the evening, all the markets across Srinagar opened in the wake of resistance programme of deal in strike after 5pm. The city markets including Lal Chowk witnessed huge rush of people and there were reports of heavy traffic jam from many civil lines areas. Reports said that a complete shutdown was also observed in other parts of the Valley including in south and north Kashmir district. At Samboora area of south Kashmir, army’s 50 RR and SOG after receiving a specific input about the presence of some militants cordoned off the area and started search operation.However, according to local sources, the residents came out of their houses and started massive stone-pelting on forces, ensuing clashes between the two sides. The police retaliated by firing teargas shells and the clashes continued for over one hour in the area after which the army and SOG lifted the cordon and retreated without conducting any operation.Reports from Old Town area of Baramulla district said that a massive crackdown was launched by army, police and CRPF since 3 am to 3 pm today and nearly 35 persons were arrested for their role in pro-freedom protests. The reports said that the forces placed the Old Town under siege and conducted house-to-house searches. Locals said that it was the ‘longest ever’ crackdown in last 15 years. According to a statement issued by the Zonal Police Headquarters Kashmir, situation across the Kashmir valley remained largely peaceful today. “Normal movement of traffic was seen with shops open and vendors dotting the roads lanes and by lanes across Kashmir. In the morning some miscreants in their attempt to disrupt the normal flow of traffic set on fire two vehicles near fruit Mandi, Srinagar,” the press statement said.The statement said that taking cognizance of the crime police registered a case under FIR number 231/2016 in police station Parimpora and started investigation, six miscreants involved in this crime have been identified and a manhunt has been launched to arrest them.Meanwhile, the statement said that in its continuous drive against the trouble-mongers police arrested 60 individual involved in disrupting public order in different parts of the valley.